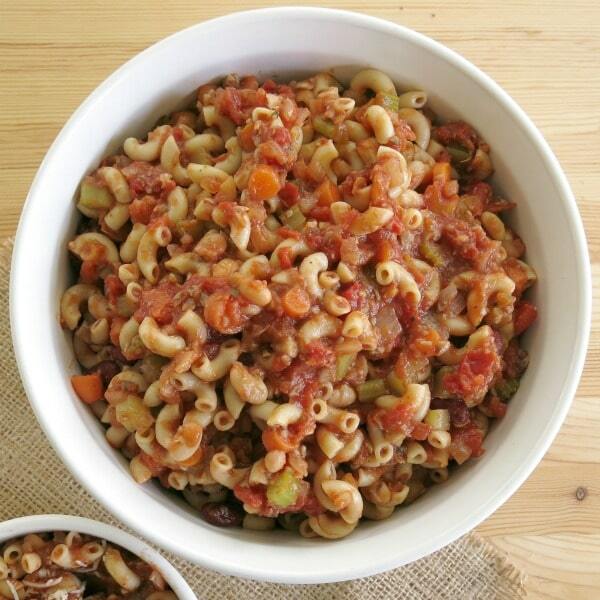 This Vegetarian Pasta Fagioli recipe replaces meat with chopped and sauteed mushrooms. Not only is it hearty and delicious, but lower in fat and calories too! 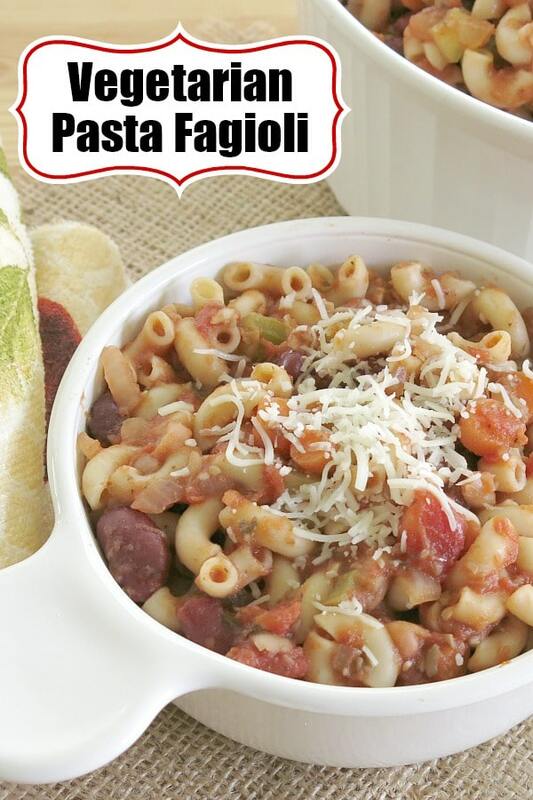 In this pasta fagioli vegetarian recipe, we used finely diced and sauteed mushrooms to replace the beef crumbles that you would typically find in Olive Garden Pasta Fagioli. It’s a meat replacement technique that I learned several years ago from The Mushroom Council. It’s called blending. Essentially, a protein (like beef) is entirely or partially replaced with chopped mushrooms. We’ve use this trick to make Healthy Meatloaf and Cheesy Mushroom Quinoa too. Mushrooms add fantastic flavor to the soup, but aren’t overpowering because there’s so much going on in this Meatless Monday recipe. Begin by brushing away dirt and finely chopping mushrooms to a consistency that resembles beef crumbles. Saute the diced mushrooms along with the onions, celery and carrots in a large pot for about 5 minutes or until softened. Add the beans, tomatoes, juices and seasonings to the pot and allow the soup to heat and simmer for about 10 minutes. In case you are wondering, there is no broth in this recipe. You didn’t miss a thing. For a thinner consistency, add up to a cup of vegetable broth or water. The longer it sits, the better it gets! Keep it on the stove for another 10 minutes or so and it’s even more flavorful. Don’t top with Parmesan Cheese and this recipe is vegan! Another option is to top with nutritional yeast. This soup freezes beautifully. Cook pasta just until it is firm since it will be reheated. To assemble before cooking, add all of the ingredients to a freezer bag and stir to combine. Remove excess air and store in the freezer for up to 2 months. Defrost in the refrigerator overnight and then heat soup on the stove-top. Freeze leftovers from a meal in single serving sized containers for a quick soup fix at another time. Reheat smaller portions in a small pot on a stove-top or in the microwave. 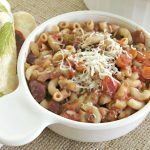 Vegetarian Pasta Fagioli replaces the meat with chopped and sauteed mushrooms. Not only is it delicious, but lower in fat and calories too! Heat 1 Tablespoon of olive oil in a large pot over medium heat. Add mushrooms, onion, celery, carrot and garlic to pot and cook for about 5 minutes or until vegetables are softened. Add remaining ingredients to the pot and cook until heated through, about 10 minutes. Reduce heat and simmer for about 10 minutes more. Use the other half of the beans to make a batch for the freezer. While you have everything out, fill up a plastic bag that seals with the ingredients. Or, double the recipe and freeze the leftovers. I made this pasta dish tonight and was pleasantly surprised by the great flavors! Definitely a recipe I’ll make again!